Recently I came across a video presentation about WordPress Multitenancy that described a great solution to an issue I have been looking for for a while. On my computer I have a lot of individual WordPress installs setup. Every time I build a website for a client, I first install WordPress on DesktopServer and add all the plugins and theme that I need for that site. That means I have hundreds of WordPress installs, many with the same plugins and themes in every install. Maintaining and updating all these plugins etc. requires a lot of time. But after seeing Cliff Seal’s presentation where he showed a way to have just one WordPress install for all the sites that run on the local server. Wuuhhuu! I set out to do exactly like Cliff explained in the video presentation, but came a cross some obstacles on the way and I thought I would just describe in detail how I got it all working on my computer with DesktopServer. The main site that contains all the core files, plugins and themes, is simply set up as normally. There is only one thing you need to change in the wp-config.php file. Add the following line of code in the very top of the file. All other sites file structure should be like this screenshot. The “wp” folder is a symlink to the main site. The “wp-content” folder is renamed to “content”. The “wp-plugins”, “plugins” and “theme” folders inside the content folder are also symlinks to the main directory. Open and edit the “wp-config.php” file and add the following code: This will access all the files from the core. That’s basically it. Now go run all your websites off of one installment and save a lot fo disc space and time updating plugins, themes and core files. During production of a website, there probably will come a time when you would want to test your site on a smartphone and a tablet. However, having to upload your site to the hosted server first just to check this is not ideal. You don’t have to do this and you can actually access your site quite easily from your local development site in the MAMP environment in just a few simple steps. These instructions only work on a mac, with MAMP installed and a wifi internet connection. 1. First, if you haven’t already, you need to fire up your MAMP application. 2. Then you should open you System Preferences and go to the Network settings page. There you should be able to see the Wi-fi IP address. 3. Then you’ll want to add these two lines of php into your wp-config file. You can access your site without doing this step, but the site will load without styles, as the the http://localhost path will not be recognized on you phone/tablet. 4. Open up your phone/tablet browser and insert the IP address and you should be able to check your site. Depending on your MAMP setup, you might have to add the Apache port after the IP address like this. 192.168.1.6:8888. PS. Remember when your done testing, remove those to lines of code from your wp-config.php file. This is my first plugin. I have long wanted to gett into writing plugins. Now I have finally released my first one. It is a very simple plugin, but something that I have needed a couple of times in my own projects. The Reorder Entry Images plugin simply gives the administrator the ability to manually sort the attachments (images only) by drag & drop on the post edit page. It will list all the images that have been uploaded on the specific post/page and one can then reorder the images. This works for custom posts too. 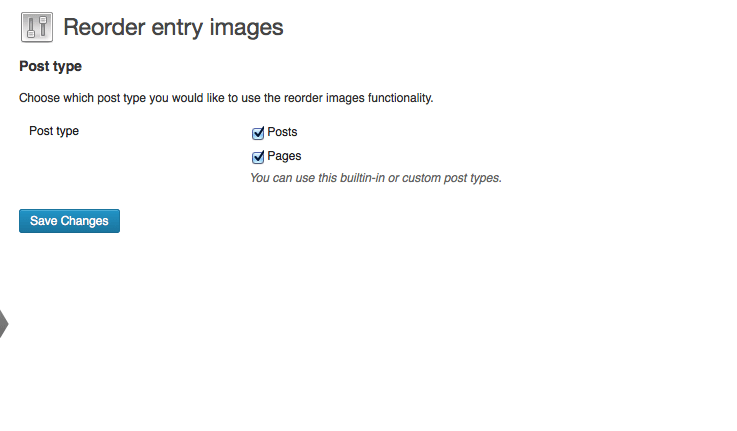 Please download the Reorder Entry Images plugin from the WordPress repository.